Inspired by an awesome taste-test of national fast-food burgers written by... ourselves!... we decided to do a local SF version, where -- instead of eating a bunch of In-N-Out cheeseburgers (wait... why didn't we do that??) 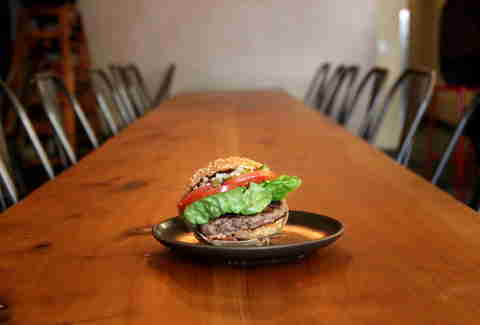 -- we decided to taste-test all of San Francisco's local "chain" burgers, i.e. 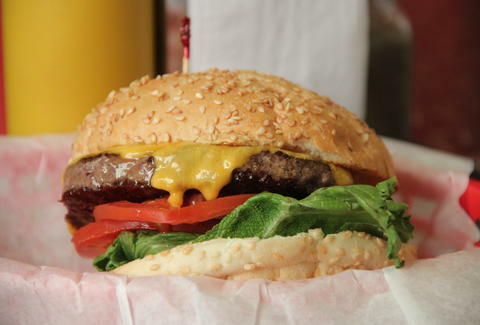 signature burgers available at restaurants with more than one location. Our rules were pretty simple: 1) The burger had to be available at multiple locations in San Francisco, meaning there's a good chance you can either get it by your house, your work, or your Tinder date's apartment, 2) we could only have the signature burger as-is, no modifications, 3) we had to eat them all in one day, and 4) no national fast-food joints. Seven burgers later, here're our definitive "chain" burger rankings. This burger is possibly the one that suffered the most from our "no additions" rule. 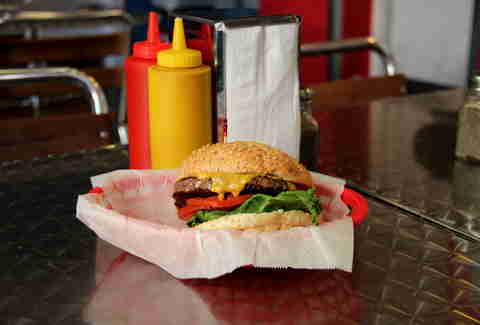 It's a great, classic burger, but would have benefited so much from some ketchup and mustard. We got the bison because we were told "most people get that", and while it's a good, leaner meat, it (according to one of our burger-tasting panelists) kinda makes you feel like you're eating an animal that'd be featured in a Disney movie. Sorry childhoods. Something someone said while cutting it in half: "Sorry, Super Duper. 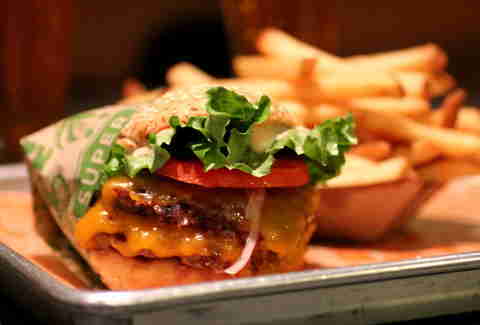 I'm doing terrible things to your burger that I do not feel good about." Probably the most cheese-forward of the burgers, you can smell it before you take a bite. The traditional seeded bun is nice, and the reliance on the flavor of extremely fresh ingredients is welcome (and tasty). The texture of the patties from the flattop is great, but unfortunately it's hurt by the fact that we had to order the original. It's just a little too much meat compared to everything else. Overall still an extremely solid contender, and easily the best deal. Okay, okay, the lady behind the counter convinced us to add cheese because that was "what most people got", so we kiiiiiiinda bent the rules. Honestly, we were very pleasantly surprised by this. It's just a really good, all-American burger. It's as juicy as any of the more expensive burgers on here, with a nice, griddled patty and a perfect meat/sauce/veggie/cheese ratio, and a good bun. If you thought this Saturn-resembling burger looked intense, it is. A random waitress (not even ours) even kindly stopped to tell us the best way to cut this thing in half so as not to lose all the juices (start from the middle!). 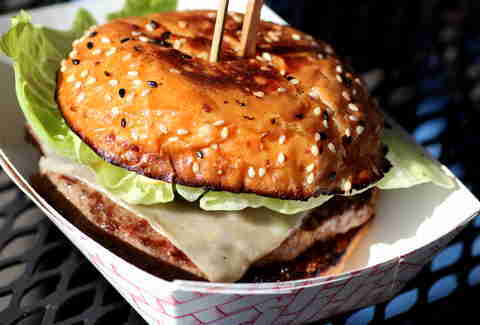 This is certainly a meat-purist type of burger; you really taste the patty despite all the condiments. The Worcestershire sauce gives it an almost Chex-Mix-y aftertaste, and the Parmesan crisp lends a nice crunchiness. Unfortunately, the bun is nothing to write home about and it feels like it's one balancing condiment away from being a truly perfect burger. As evidenced by its placing, this is probably one of the best burgers in the city. Even if you're used to getting a Rueben, you gotta try this. 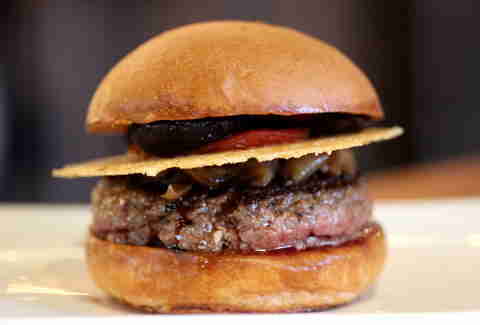 It tastes like a traditional Jewish deli in a burger. Everything goes together pretty perfectly: the veggies are pickled to perfection and the mustard adds an excellent tang. The pastrami patty is airy and light, well-cooked, and the challah bun has made the best of the "chain" burger bun-options. The one thing that kinda weirds us out, though? 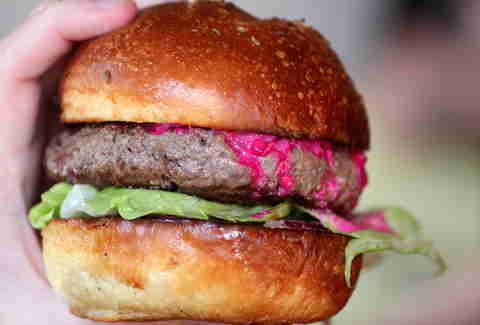 The bright pinkness of the beet sauce. This burger is so well cooked, it practically melts in your mouth (cliche, sorry we're not sorry), with an amazing balance of bacon crispiness-to-meat juiciness. Even though it looks like it'll devolve into a sloppy mess, it somehow actually stays together really well. 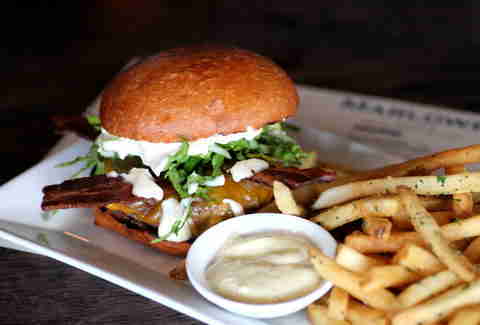 The bun-to-burger ratio is great, and the horseradish aioli is just strong enough to give it a nice kick. The only reason it's not No. 1 is because, at $14, it's the priciest one on here. Here we have it: perfection in burger form. This baby is just amazing in its delicious simplicity. The bun is buttery and delicious, there aren't an overwhelming amount of condiments and, the fresh ground meat gives it almost all the flavor (ground less than a day ago from their premium quality meats). The cheese and secret sauce compliment, rather than overwhelm, and it's perfectly cooked and juicy. And it's all $8. Now, if you'll excuse us, we're never eating again.